Use our Bite Size Envelope Mold to create classic chocolate candies and seal with a kiss. Real Chocolate makes the best tasting candy. Learn to temper our cocoa butter based products from our link to the Mr. Chocolate video. 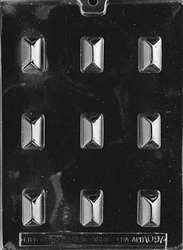 Use our Bite Size Envelope Mold to create classic chocolate candies.